And westward we march, now amongst the trails of Range 22 West. 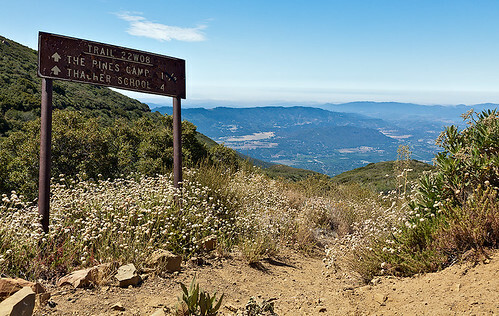 These routes tend to concentrate in the Chumash Wilderness or the Ojai/Rose Valley area, either side of Nordhoff Ridge. 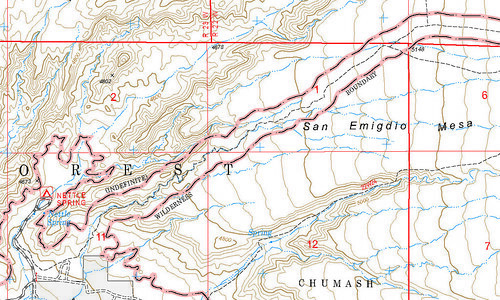 Drawing a corridor separating the lonely western fourth of the Chumash Wilderness from its better-visited east section, the Toad Springs trail was until the mid-1990s an OHV route (Trail 105) when a landslide closed it indefinitely. It seems unlikely it will ever be officially re-opened, but of course that doesn’t keep dirt bikers from cutting the fence and heading in. I spent a fair amount of time along this route as a kid. 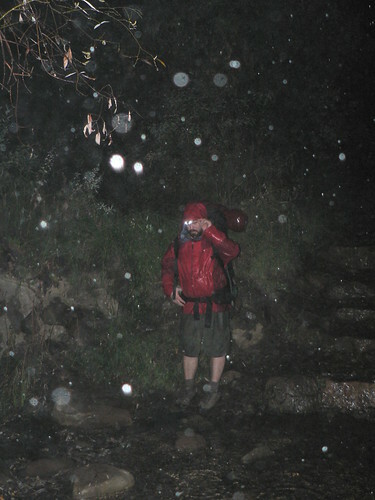 On Memorial Weekend 2011, the RSO and I were witness to a bizarre graupel shower whilst hiking the route. The RSO along the 22W01, St Patrick’s Day 2011. 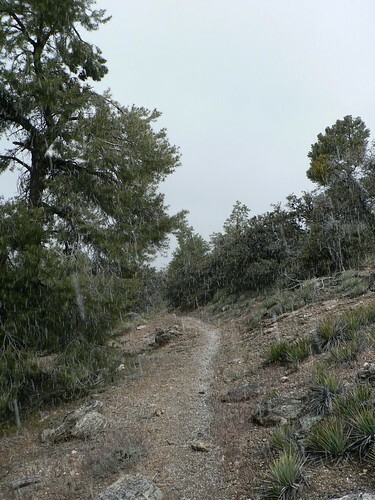 Along with the Tumamait (Pinos-Abel) route, the trail I’ve probably set foot on more than any other. 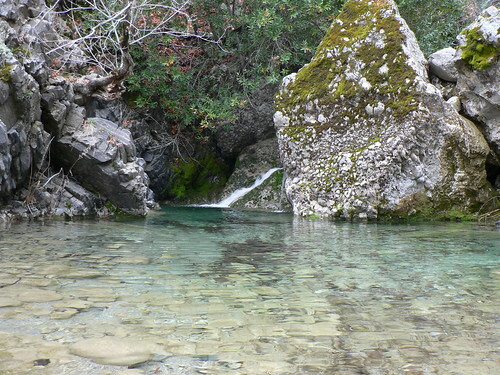 Growing up as a Boy Scout in Ventura County, Camp Three Falls was an annual trek, and as the route’s southern trailhead, it made visits to the nearby Middle Fork Falls a foregone conclusion (and a great “short-cut” to the lake if you were camped up-canyon). 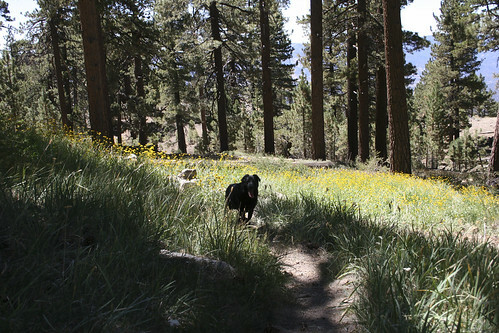 Over the past decade, our annual Chumash Wilderness spring trek has been to Lily Meadows seven times now. Bo and the uber-hund at Lily Meadows, Spring 2010. G and Mad-eye at Lily Meadows, Spring 2011. 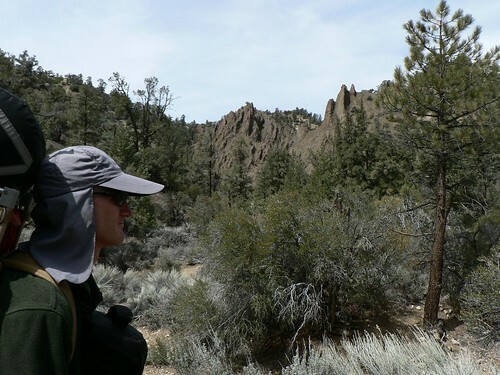 This route was the one our Scoutmasters marched us up in preparation for Sierra backpacks and Philmont treks; if you were on the High Adventure crew you had your favorite spots to bed down at both Lily Meadows and Sheep Camp. And even young lungs never forgot this route. Smokey amongst the Irises, Summer 2007. Photo courtesy and © the RSO. Bo and the Tors, Spring 2010. Breakfast with the Old Man, Fall 1993. 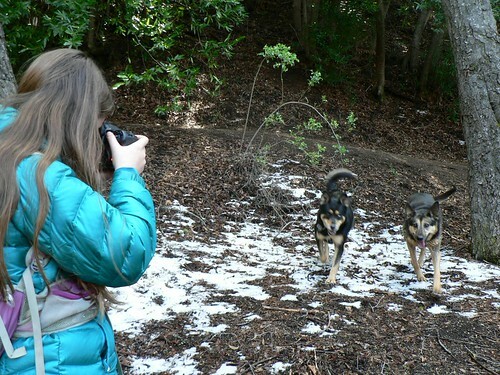 G and Mad-eye @ Upper Reyes, Boxing Day 2011. Three for three! The routes upon which my boots have spent a disproportionate amount of time (and labor) all seem to fall in the 22 Series. DAW-G north of Twin Forks, Spring 2009. Yet here is also where we hit our first cartographic hiccup. 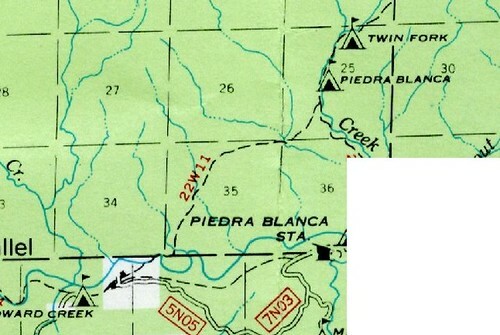 Before the establishment of the NRT this route bore two separate designations: 23W02 for the stretch from Reyes Campground to Haddock (the junction with the Reyes Peak Trail); and 22W03 was only the stretch from Haddock to Lion (now the Piedra Blanca TH). Transposed numbers back then, consolidation post-NRT, or modern-era oversight? I’m inclined to believe the latter, though would concede the consolidation. 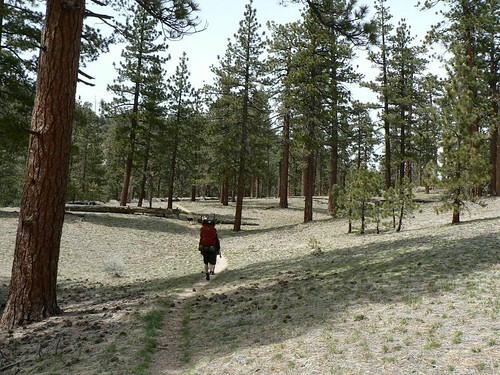 This is one of the greatest routes in the southern LPNF: it features seven trail camps over roughly 18 miles, the northern five of which are high enough to feature towering Incense-cedar and/or Ponderosa cover. HRH at Beartrap, Spring 1997. Gathering of the Clans @ Upper Reyes, Spring 2008. 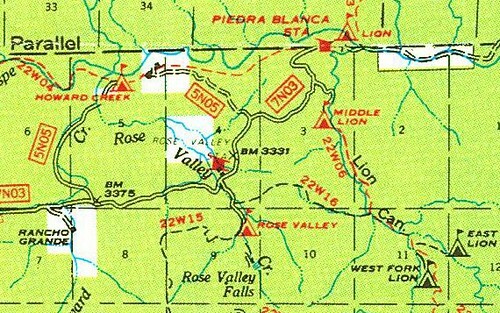 As recently as the 1990s, this route featured a campground at either end; Beaver at the western trailhead and Lion at the eastern. 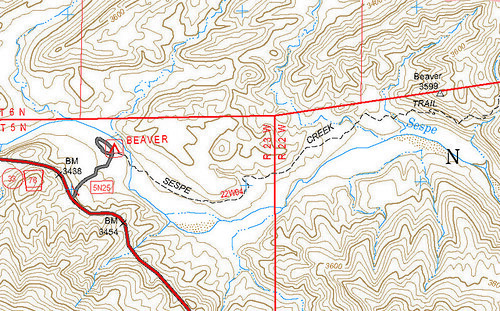 Now Beaver is the Middle Sespe Trailhead (and in recent months blocked by mounds of dozered earth), and Lion is the Piedra Blanca Trailhead. The times, they are a-changing. 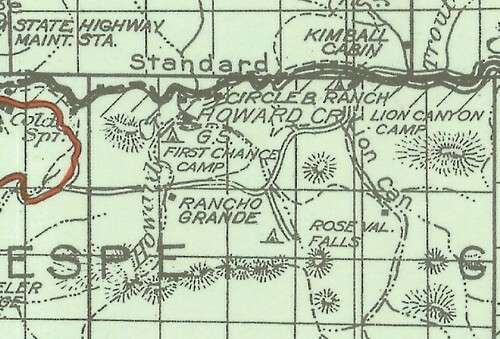 Earlier maps show different routes closer to (and crossing) the Sespe near Howard Creek, and no tread from the properties there to Lion. DAW-G and Mad-eye at the Rock Creek Crossing, Fall 2010. For those interested in such things, Middle Sespe seems to display a disproportionate number of really cool lizards. We encounter a few interesting specimens (whiptails and alligator lizards, I think) every time we walk it. Gridley Signage, 1979. Image courtesy and © the Los Padres Expat. For the Expat’s May 2012 “reminexisploratory” of the 22W05, see here. This route is possibly the most popular means of gaining Nordhoff Ridge, and sees a fair amount of mountain bike traffic. 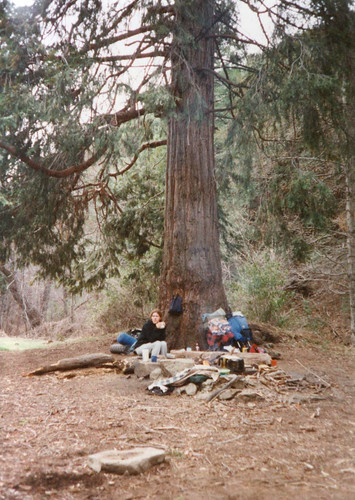 The sorry little trail camp at Gridley Spring constitutes the “leftovers” of the pre-Wheeler Fire (1985) site that once stood on the south side of the trail. I can’t imagine anybody actually camping there. View along 22W05, Fall 2009. 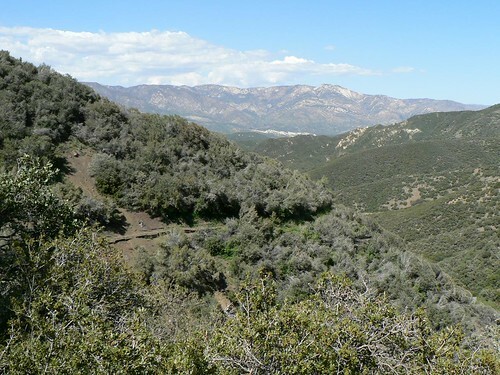 One of my favorite Ojai-area routes. 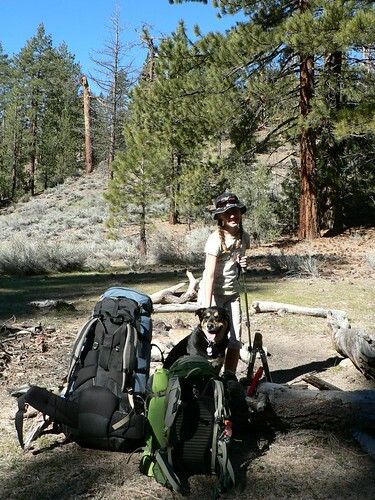 In the winter of 2010, the RSO, DAW-G and some of the pack and I did an up-and-over from Middle Lion to Thacher, hitting West Fork Lion, East Fork Lion, and The Pines (see below) along the way. Good times! 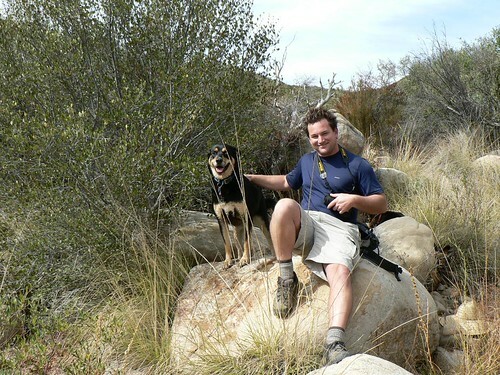 The uber-hund and Mad-eye, checking on their biped along the upper Lion Canyon trail. Winter 2010. 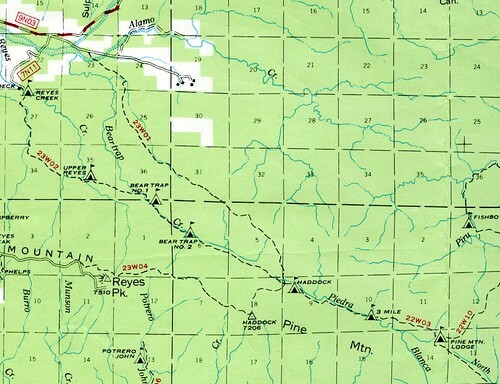 Some maps mark the East Fork spur as “22W06A,” so it stands to reason that somewhere the West Fork was at some point considered “22W06B.” Both lead to cool waterfalls, though the camp at East Fork is a better spot and as such receives far greater traffic. The Uber-hund at Rest, Upper Lion. Yeah, I know. Not sure why the old ridge road has a trail designation here, or why it’s shown as singletrack west of Nordhoff Peak and east of Sisar Peak. Anyone? See the 22W11 entry below, where I discuss the current MPRD MVO map. 22W07 may also be applied to Trail 110, a piece of the old Wagon Road trails. 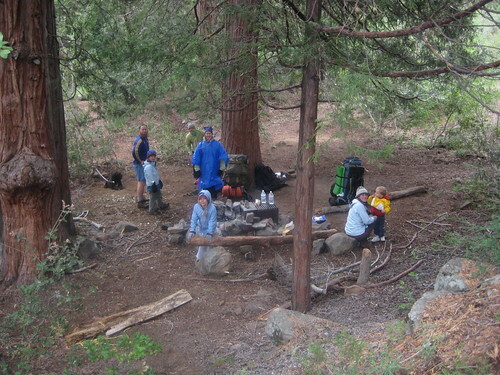 Climbing from Thacher School to Nordhoff Ridge, Horn features The Pines, a campsite set beneath a copse of Coulter pines. 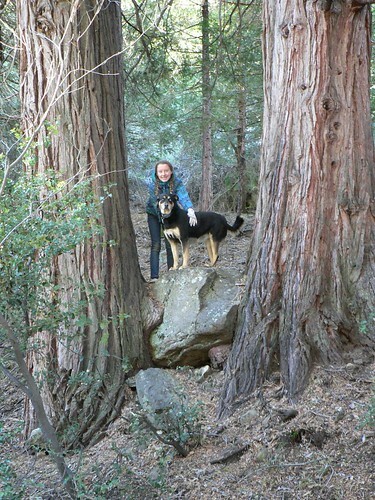 These trees are the survivors of a forestry experiment conducted by Jacinto Reyes in the 1920s and 1930s; fires have taken their toll but — with some help by Thacher students and others — the site lives. The RSO along the lower 22W08, Winter 2010. The Pines as seen from above; Fall 2012. Image courtesy and © the Los Padres Expat. 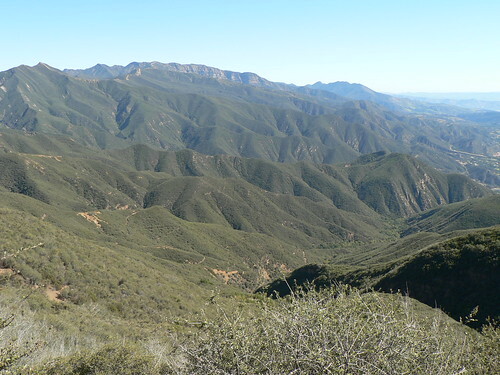 This is a great little west-east route in the very front of the Ojai frontcountry. 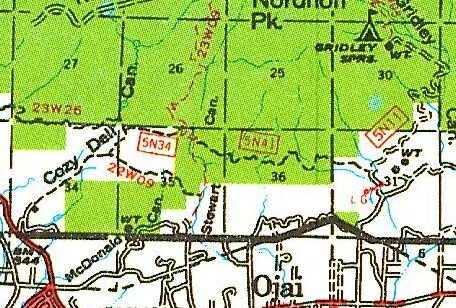 Older maps only show the length of tread from Cozy Dell to the Stewart/Pratt TH and connectors, but an eastern leg (unmarked as of this writing) continues east toward the OVLC’s Fuelbreak Road route. And the eastern portion isn’t some guerrilla route; it’s well-groomed with waterbars, switchbacks, and the like, and receives heavy traffic. 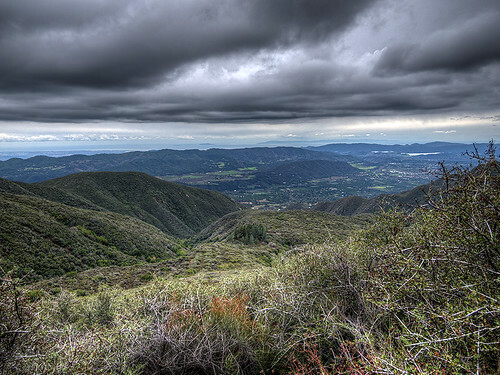 The RSO along the Foothill Trail, December 2012. 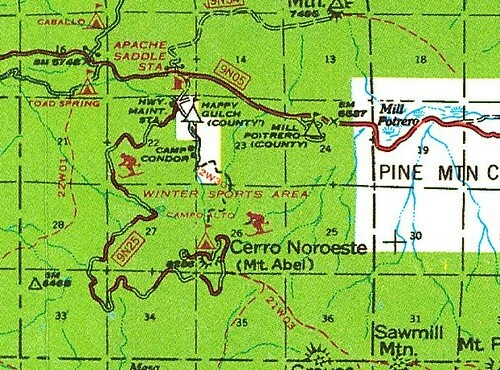 From Pine Mountain Lodge, this 2.4-mile trail heads NE over the divide between North Fork Piedra Blanca and Cedar Creeks. (Of course, it’s also part of that whole Fishbowls/Cedar Creek imbroglio. Re: label doppelgangers, this marker shows up south of Dome Springs as well (see next entry). Here, finally, we land upon one of the abandoned routes of Range 22 West. I’d originally given this the moniker “Western Piedra Blanca” for lack of any intel or anecdotal references, but after a conversation with retired John Boggs, I’ve learned this was the “Blanca Trail.” This route once led SW from Piedra Blanca trail camp over scrub and chaparral to the terminus of the eastern section of the non-contiguous 5N05. The tread of this route was available in post-Day Fire orthoimagery, and the early months of 2007 would have been the best time to scout out the old route, but I’ve yet to pursue any serious recon. I believe Eric over at Ventura County Canyoneering explored an upper section of this route during an exploratory he did in the Fall of 2010. 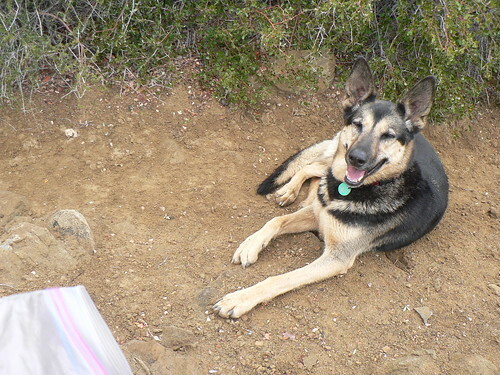 Now, I should also point out the suspect 2011 Mt Pinos MVO map marks the middle leg of the Dry Canyon Trail (part of Trail 109) as 22W11 … but Pinos OHV maps are so chronically inaccurate that it’s with a heavy heart I dismiss them. I’m including mention here for the sake of being thorough. Maybe (see above). See how one map can throw such a figurative wrench in the mapworks? Another head-scratcher, at least in part. 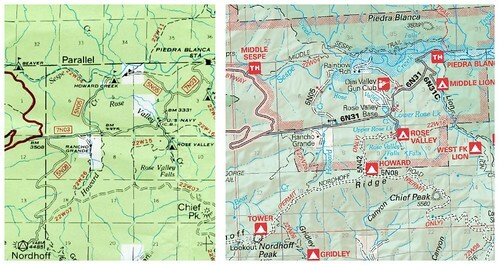 As with 22W07, above, some legacy maps show Chief Peak Road as a singletrack, with the trail designation 22W15. Walking the Chief Peak Road with Mad-eye, Winter 2010. 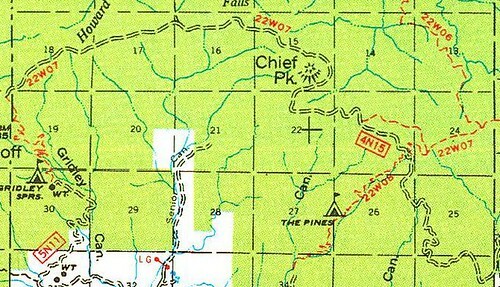 More modern incarnations indicate the short trail to Rose Valley Falls is trail 22W15, or 22W15A. Not sure what to make of these discrepancies. 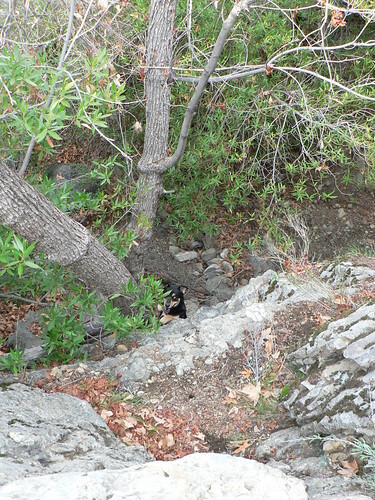 Li’l G, Mad-eye, and the uber-hund along the Rose Valley Falls trail, Spring 2012. 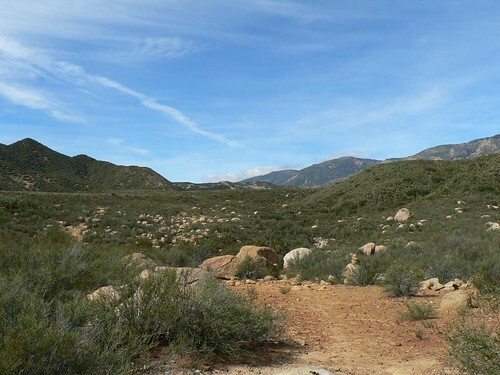 From just below Rose Valley campground, this short trail connects with Lion Canyon to the east. A good alternative if you wish to avoid the Middle Lion parking and party scene, and are keen to keep your feet dry. 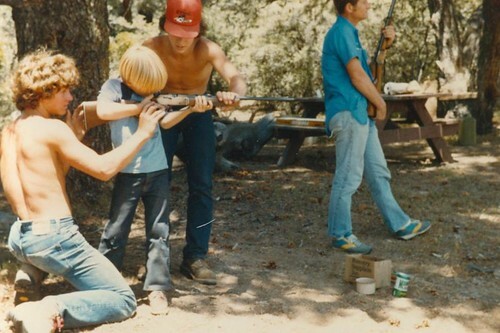 Portrait of the Author as a Young Target Shooter, Spring 1981. 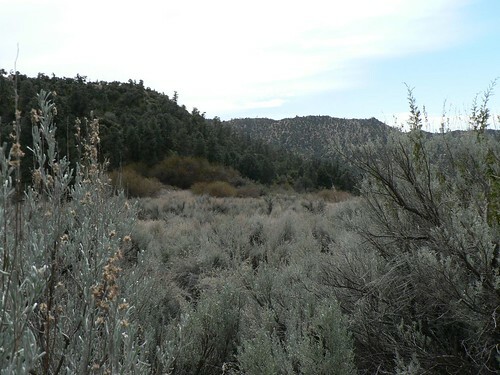 The Old Mesa Spring Road (now lower 22W21), Spring 2011. 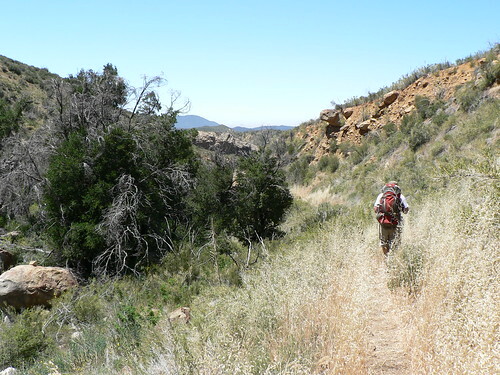 Out on the San Emigdio Mesa, this old 4WD camp is now within the Chumash Wilderness. This was a frequently-visited spot by the Clan Carey before the ’92 wilderness designation, we five rattling up Apache Canyon road in the little red Bronco. In later years, my Scout troop would use that as a taking-off point for cross-country (map and compass training) treks across the mesa, and a mid-way point between our start at Sheep Camp and the tor-like formations below Middle Fork Falls. So awesome. Image courtesy and © Roy Ubu. 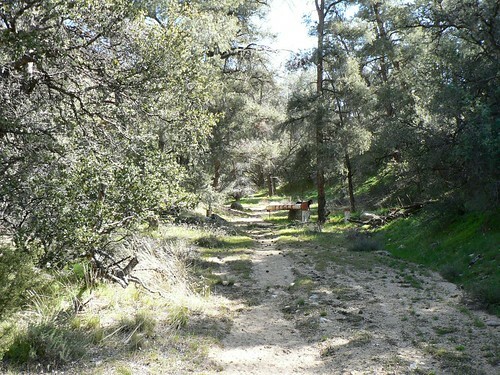 This is the lower route that once connected Cienega camp campground with the road to Mesa Spring. In the spring of 2001, the RSO and JP-san and I found ourselves on this route (not knowing it existed) during the infamous Apache Monster trek. JP-san along the lower 22W24, Spring 2001. We were surprised to find this sign. Image courtesy and © the RSO. A decade later, the RSO and I returned with some hearty hound escorts to triangulate back to the old Cienega site. You can read that TR here. 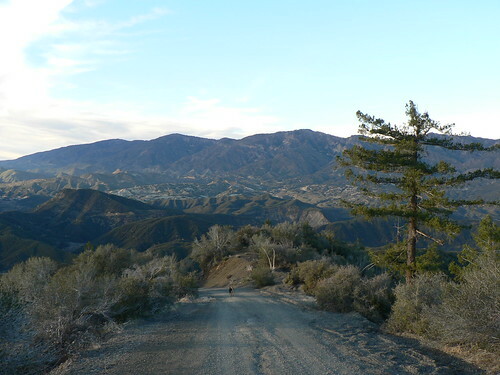 This route, the line of which has changed some over the decades, leads from the Sespe River Road (commonly known these days as Rose Valley Road) up to Nordhoff Ridge and the new-ish Howard camp, a dry 4WD site. Whilst researching some of the Howard Creek history, the monkeys and I reconned the old First Chance campsite this past fall. Well this was a surprise! 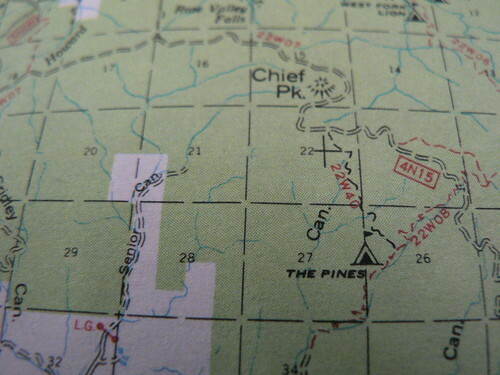 Whilst inventorying 22W trails in the nascent stages of this post, I stumbled up this route on the 1978 Visitor’s Map. So I put the word out to select sages of the sagebrush, and of course the Expat regales me immediately with tales of snowshoeing that route in the 70s. It was known to him and a cohort as the Camp Condor Trail … and so it shall it be. 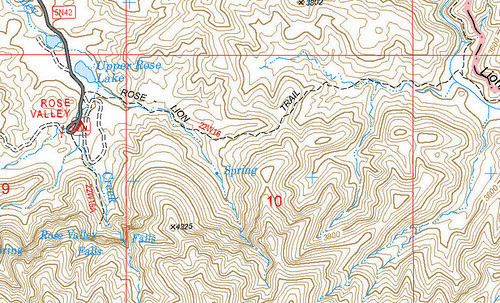 The inimitable Hiker Kim also weighed in, positing the old 22W30 is likely the easterly of the two current ridge trails favored by area mountain bikers (esp. downhillers). Need you even ask? This sounds like a great day trip, and you can expect an exploratory report in due time. 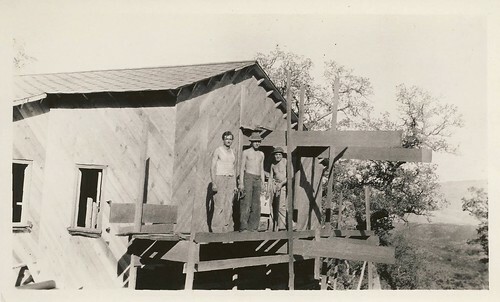 Cerro Noroeste Ski Hut under Construction, 1942. Image Courtesy LPNF Archives. Another abandoned route for which I have no name, let alone intel. Was it a p-line? Dozer line? Somebody’s dream that never came to be? I’ve scheduled a meeting with a member of the Guru Brigade, that fount of detailed Forest lore, to ascertain what I can. Will update here as appropriate. So now it is down to the nitty, and the gritty: the one definite route for which I don’t have a designation, but that likely would (or did) qualify. Abandoned ages ago, this route once split from the Fishbowls trail while still in the main Piru drainage and headed NW up and over those unforgiving badlands. 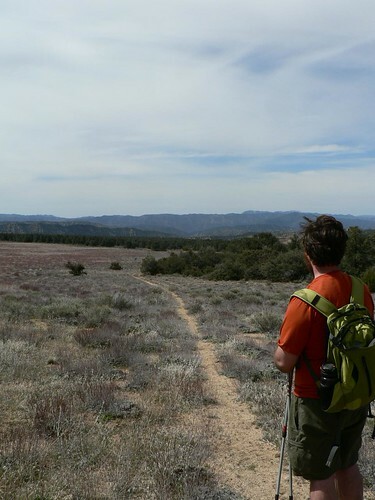 If the USDA was handing out the range-based trail numbers in this trail’s lifetime, it was certainly a 22W. 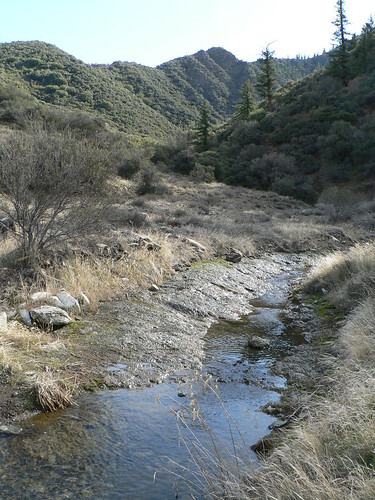 At its western end it leads to the confluence of Beartrap and Alamo drainages, which is technically the headwater of the Cuyama River. Tempting, n’est-ce pas? 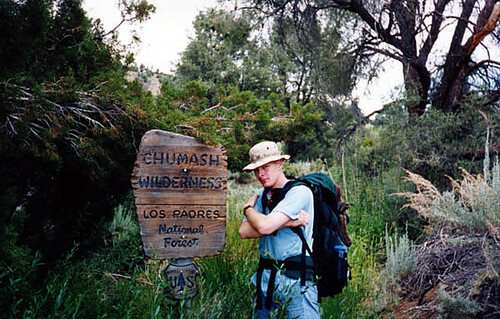 This entry was posted in Uncategorized and tagged chumash, forest, hiking, los padres, maps, national forest, nordhoff, ojai, rose valley, sespe, wilderness. Bookmark the permalink. I offer you this geotagged photo as evidence that 22W40 may have really existed. Thanks Valerie. You reckon this is the junction, and not one of the corner markers? I’m not sure what you mean by corner markers. It seems to have bolts in it where signs could have been removed and if I were to place it on a map from memory, it would go right about where that junction is shown. 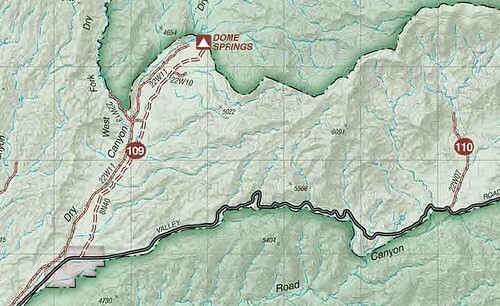 I just added the geotag location to the map on my Horn Canyon post so you can see. That’s it then, you’re right. Time for some exploratory! 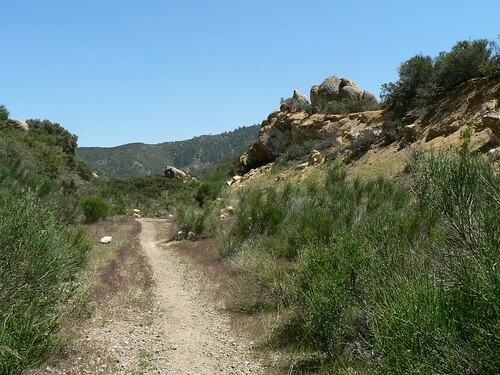 Re: corner markers, those can range from a rock cairn, a steel post like the one you spotted (there’s one near the Sespe/Red Reef junction just like this), or at sections they’re usually a bonafide monument like those near Halfmoon campground or in Bear Canyon (above Ozena). But the one you tagged is definitely not near any corner, so that’s quite promising. Exxxxcellent. So a corner marker could be anything! Looking a little more at the bolts, I can’t help but notice that they’re long enough that “removed” could actually be “burned”. 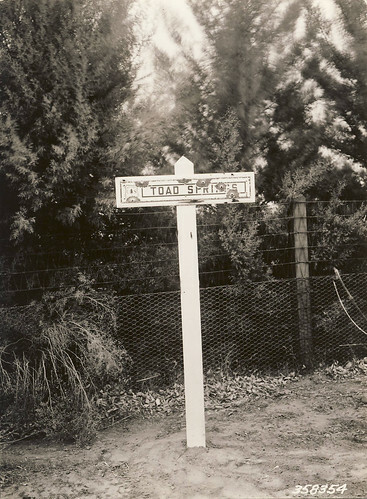 The possible track leads in the correct direction on the left side of the post, but it is a very tiny tunnel. Good luck, and have fun. 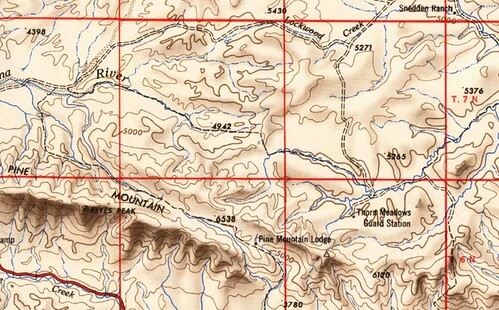 The Lion Canyon 1943 USGS map clearly shows what appears to be a slightly different location of the northern trailhead of the unnamed trail – at Chief Peak Trail (?) 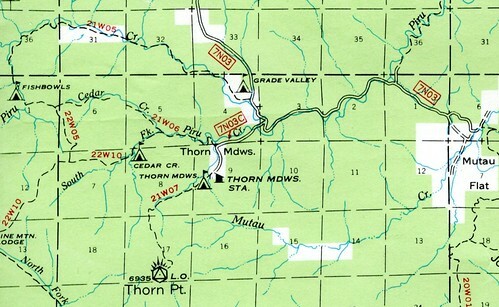 – than what the map in question shows. 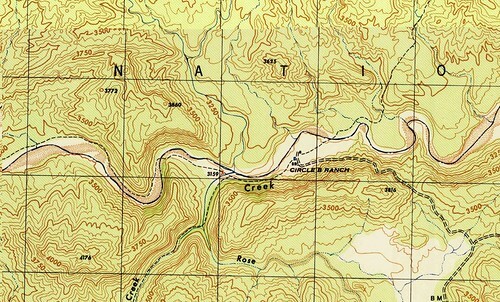 On the next Lion Canyon – 1991 – it is no longer there. 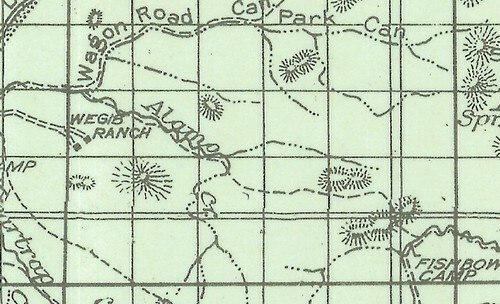 On the Santa Paula, CA 1947 15 min map the southern trailhead – at Horn Canyon Trail – is seen. 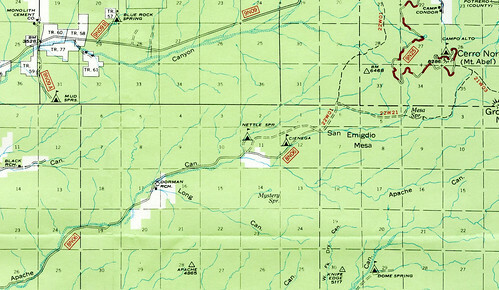 The southern terminus can also be seen on the Ojai 1952, the 1952 photorevised 1988 map, but alas, gone on the Ojai 1995 map. Google Earth’s various satellite photos down through the ages also shows, at various points of time, what appears to be the trail. I vote 22W40 existed. This “Series ___ ” set of articles about about trails and places that no longer officially exist (but kind of still do) never ceases to interest and amaze me. So many such places, so much brush and (at least relatively) so little strength. Alamo Canyon Trail (north of Fishbowls to Wagon Rd) is a good route. 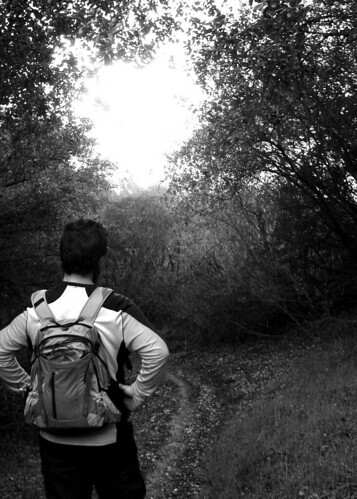 A friend and I backpacked thru here in early June of 2008 (normal rainfall year). Spent a nite on Piru Ck where route takes off to NW. Next nite was in Wagon Rd Canyon. 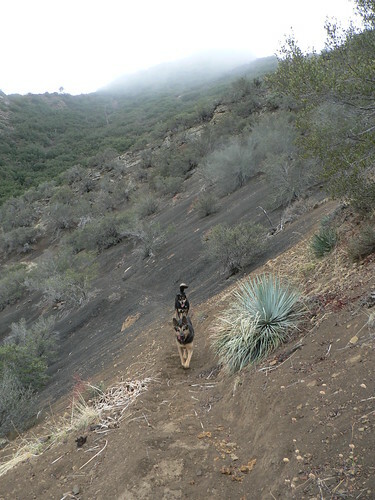 Although no trail, its a naturally open route, along a sandstone creekbed with only bad brush for ~1/2 mile from saddle down into Alamo Ck. Perhaps bears are keeping it open as evidenced by many tracks. There was water available along the way. Fire did not burn from saddle beyond to the west. Overall, scenic and historic route. Thanks for the intel, Spencer. Any photos from your trek? It’s got some signage here and there but most of it looks pretty beat up.